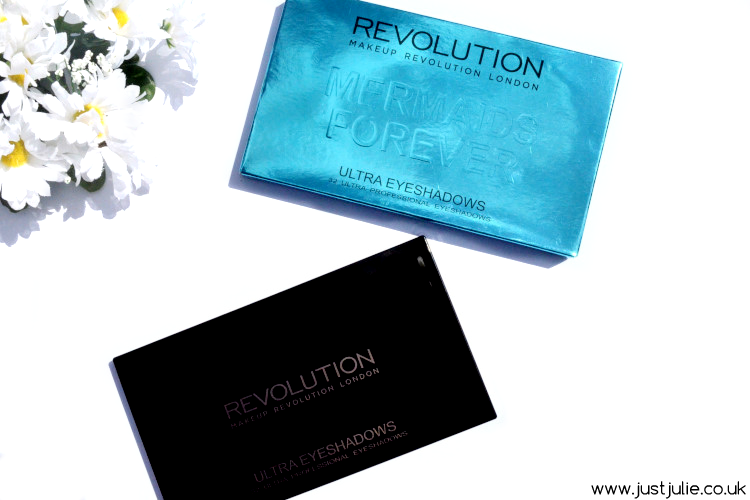 I have an ever growing drawer full of Makeup Revolution palettes and a couple of them are my go to palettes on a daily basis, so when the new Makeup Revolution Mermaids Forever Eyeshadow Palette* popped through my letter box I thought it was fate, I mean it's called Mermaids and with my new pink hair do, I feel all mermaid like, so yeah this palette must have been meant for me! 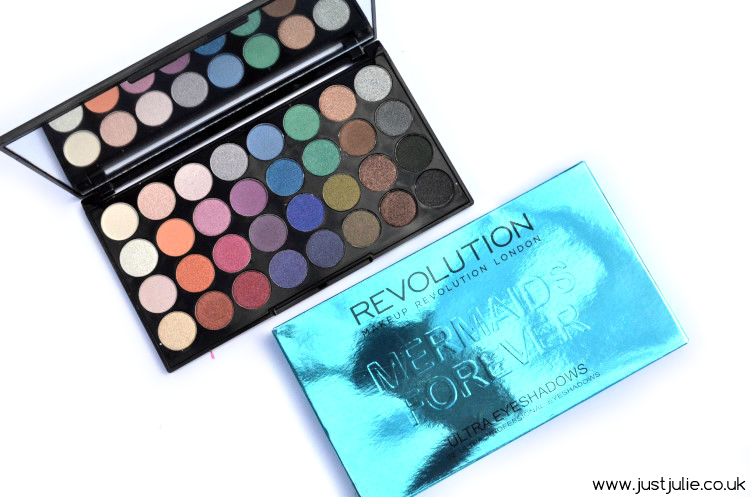 With the name Mermaids Forever and the shiny blue outer packaging I was expecting a lot of pinks, blues and purples, but there's so much more of a good mix of colours, you have emerald greens, greys, copper colours, pretty much every colour you can think of is included within this 32 eyeshadow palette. The palette comes in the standard black glossy palette which includes the large mirror, personally I'd love to see a few of these themed palettes actually come in a different colour case, as I feel that would just add a little something extra to this palette. As you can see this palette is full of some gorgeous bright colours so it's going to be more aimed towards those who like to create some daring eye looks, however with the inclusions of some browns, nudes and peaches you can also create something not so in your face. 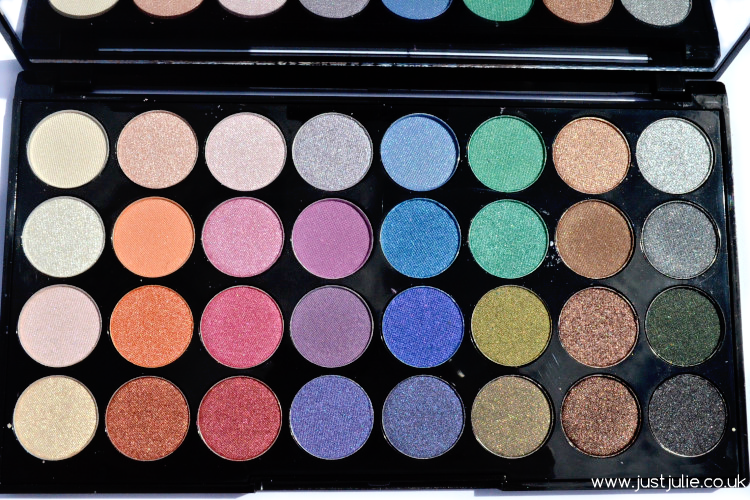 I'm going to be honest, this isn't one of my favourite palettes from MUR. I normally sing their praises with the quality and pigmentation but unfortunately some of these shades weren't pigmented enough and I really needed to go in to get a swatch to show up on some of the shades. The first row were the hardest to swatch and the pinks and purples just don't show up enough on my eyes. However the browns, greens and copper shades are much more pigmented. I have mixed feelings, some of the shades are great quality, whereas others aren't up to the normal standard that I have come to expect from MUR. However at just £8 it's still a massive bargain and there are some fab colours to play around with, this one just wasn't a huge winner for me.